The old tractor sat at the end of the yard. One morning we walked by it and saw a giant granddaddy longlegs on the seat. I was terrified. My dad picked it up and put it on his hand. He showed me they were okay and there was nothing to fear. 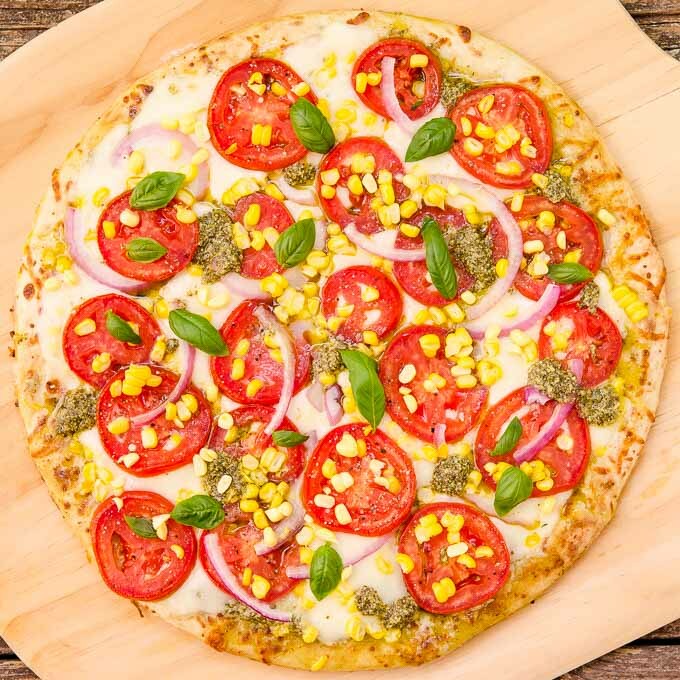 What does this have to do with Corn and Tomato Pizza? Only that I think of my dad, his tractor, and the corn he grew in the garden when I was a kid. Riding with dad on the tractor was so much fun. I remember the sound of it and those large back wheels. I’d watch as we went to the garden and the tracks they left. The smell of the dirt as he plowed was different than any other time. It was as if a freshness was being released from the earth. Shucking corn has no fond memories. I’ve despised it from the very first time. The worst part? It’s the worms. I don’t care how harmless they are, I can’t stand to touch one. Then there is the silk. Getting silk off the cob is frustrating. Yet every year I do some shucking when fresh summer corn is at the market. Fresh picked tomatoes are divine. I go to farmers markets just to get some. Unfortunately I do not have much success growing them. Plus there is the worms factor again. Those tomato hornworms give me shivers down my spine. I’ll let someone else deal with them. 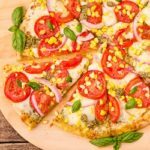 This Corn and Tomato Pizza is an easy version. I utilize pre-baked pizza crust and store-bought pesto. Of course you can do homemade for both or either if you want. You could also thaw some frozen corn kernels to use instead of dealing with fresh corn. Although you might as well enjoy fresh summer flavor at its finest. What’s all on the pizza? Pesto is the sauce. Some corn and parmesan cheese go on next. Sliced tomatoes, fresh mozzarella cheese, and red onion are scattered about. Then a final sprinkling of more corn on top. After it bakes, a final touch of fresh basil leaves gives it more garden goodness. Slice it up and enjoy a tasty meal featuring summer produce. What are your favorite corn and tomato dishes? A few of mine are Mediterranean Tomato Tart, Hatch Chile Shrimp Corn Chowder, Succotash, and Elote (Mexican Grilled Corn). 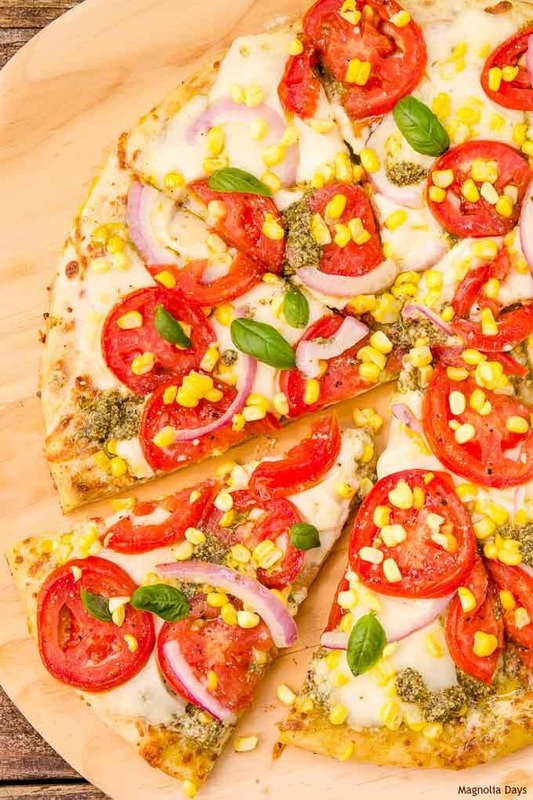 Now I’m adding Corn and Tomato Pizza to my list of favorites. It really does highlight fresh summer flavors and brings back treasured memories. 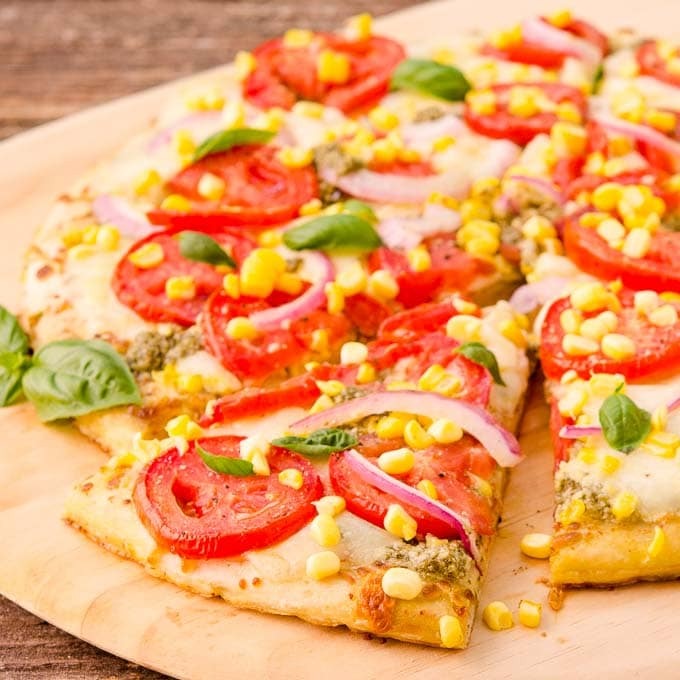 Corn and Tomato Pizza is a tasty meal that's easy to make with pre-made crust and pesto. 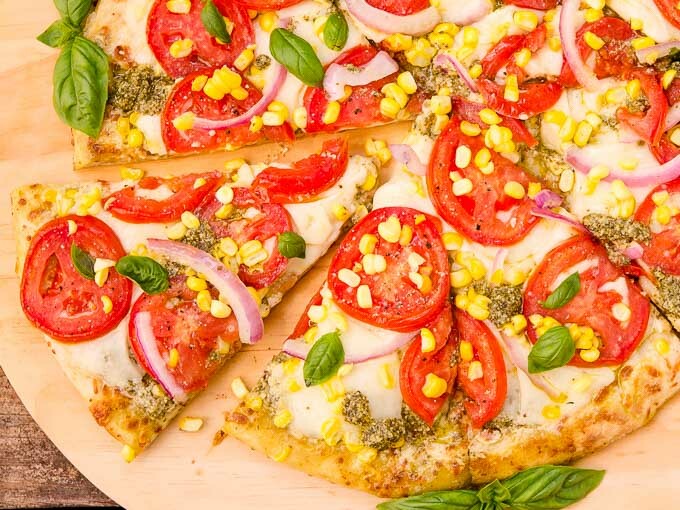 Use fresh-picked corn and tomatoes to make it spectacular. Heat oven to 450°F. Line a baking sheet with parchment paper. Place tomato slices on paper towels. Sprinkle tomatoes with salt and pepper. Let stand for 20 minutes. Cover tomato slices with more paper towels and press lightly. Place pizza crust on baking sheet. Spread 1/3 cup pesto on crust. Sprinkle half of the corn kernels and all the Parmesan cheese on crust. Top with mozzarella, tomatoes, and red onion. Sprinkle remaining corn kernels on top. Put small dollops of remaining pesto on pizza. Remove pizza from oven and sprinkle basil leaves on top. Recipe adapted from 2013 Southern Living Fresh Garden Recipes Special Edition Magazine.